We are Patch of Land. Peer to peer lending is a method of debt financing that gives individuals the opportunity to lend and borrow money without the need for backing and mediation of a traditional financial institution. In the case of the borrower, the terms of payment may vary depending on the agreement of all parties involved. Investors in a P2P lending vehicle are generally guided by the terms and conditions of the specific company that they are investing with. Peer to peer lending through Patch of Land, Inc. shares a commonality with REIT or Real Estate Investment Trust, in that both are vehicles for investing money in real estate. However, the similarities end there. With Patch of Land, the investor has the freedom to choose which real estate loans to invest in; whereas in REIT, investors entrust their capital to the institution that offers REIT, without being given the option to choose which property to put their money into. Patch of Land can be thought of as a personal REIT, wherein the investor makes the decision of which real estate to invest in. The interest earned from peer-to-peer lending is considerably higher compared to interest earned from a treasury bill, certificate of deposit, a bank account, and many types of bonds. In addition to high yield returns, monthly income distributions, full transparency over due diligence process, historical loan and borrower data, and we work within your parameters or credit model to produce solid and successful results. Peer to peer loans allow borrowers quick access to money from other individuals (i.e. their peers) without going through large financial institutions which are typically overregulated and take a long time to process. 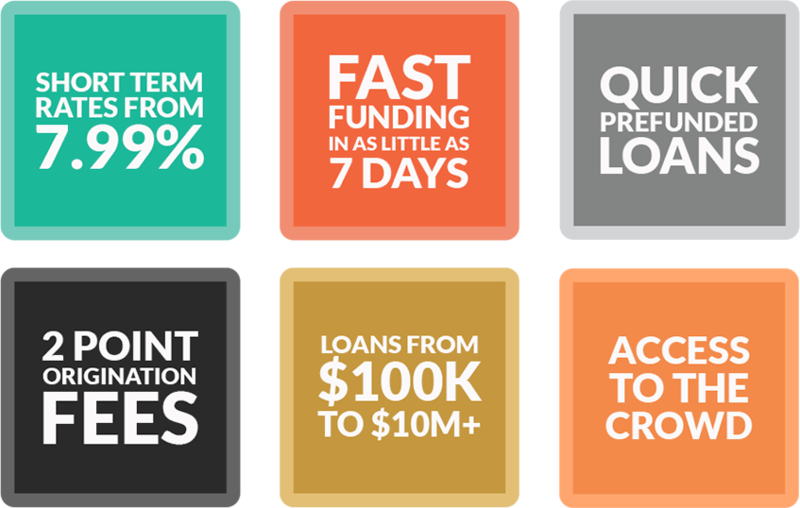 As a result, Peer to peer lending is faster and more efficient than traditional lending methods. For the benefit of first-time investors, this type of investment is also known as crowdlending. Crowdlending is gaining momentum due to increased security measures used for transferring funds online, as well as the constantly expanding reach of the Internet. It's the ideal way to get access to funding for capital, or production costs, because it provides access to investors whom they normally wouldn't be able to reach. With many peer to peer lending sites beginning to launch, investors and borrowers are advised to take precaution and make sure the site they choose to partner with is legitimate, transparent, and fair. Patch of Land practices full transparency so that all our investors are well-informed about where their money is going and how much they should expect to get back. Click here to learn more about peer to peer investing.